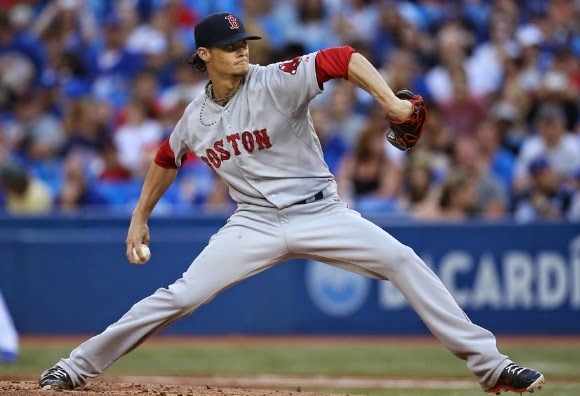 Clay Buchholz turned in an impressive eight scoreless innings, Dustin Pedroia drove in two runs, and Yoenis Cespedes drove in the game-winner as the Red Sox snapped their eight-game losing streak with a 4-3, 10-inning win over the Blue Jays in Toronto on Monday night. The game was not without its drama, including a "What's wrong with Koji?" ninth inning. Boston took a 3-0 lead in the top of the fifth inning on home runs by Mookie Betts (solo) and Dustin Pedroia (one on). Buchholz, for his part, was cruising, allowing just two hits and walking one through eight. In the ninth with one out, he allowed back-to-back singles and a walk to load the bases. Enter Koji Uehara. Cue the drama. Uehara induced an RBI-ground out by Adam Lind and then gave up a booming two-run double to Edwin Encarnacion to tie the score. In the top of the tenth, Brock Holt singled and then stole second and third. Cespedes drove him in with a single to give the Sox a 4-3 lead. Craig Breslow pitched a scoreless bottom of the inning to get the save and give Koji the win. Toronto's three runs may have all been charged to Buchholz, but clearly Koji has hit a serious rough patch. In his last four outings he's gone 3.1 innings, given up 10 hits and allowed seven earned runs. His ERA has jumped from 1.27 to 2.25 over that span.